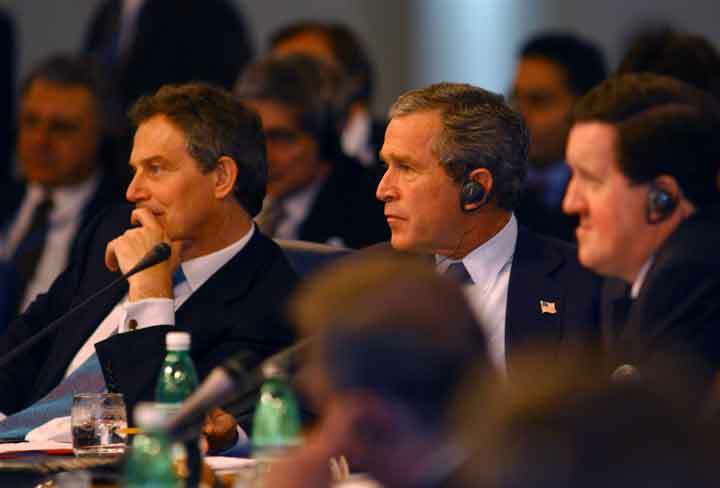 Tony Blair and George W. Bush at NATO conference. him "I'm a uniter, not a divider," said George W. Bush during his presidential campaign. He got that one right. He has managed to unite the whole world against him and the war he proposes to wage against Iraq. opposition From New York to Johannesburg, millions of people hit the streets last weekend in the largest collection of anti-war demonstrations since the Vietnam War. The biggest, record-breaking protests were in the countries whose governments have allied themselves with Bush: Rome (one to three million) and London (750,000 to one million). democracy So much for the "coalition of the willing" that Bush has promised to lead to war if the UN Security Council won't back him. The people who live under the NATO governments that are backing Bush, according to European polls, are overwhelmingly against a war without UN approval: Britain (90 percent), Italy (73 percent), Spain (90 percent), and Turkey (94 percent). Even in the "new Europe" of the East, whose cash-poor governments have wasted billions on weaponry so they could join NATO and curry favor with Washington, large majorities are against the war. The truth is that if the world were made up of real democracies, Bush wouldn't have one single country on his side. case But he still doesn't get it. Alternating between the roles of the spoiled rich kid who buys his friends and the belligerence of the neighborhood bully, he has been slow to learn that neither Washington's money nor all of the Pentagon's advanced weaponry can win friendship or respect among the people of the world. Mr. Bush is doing somewhat better on the home front, where polls have found majorities favoring "military action." This is the result of a media that repeats his arguments endlessly and only occasionally provides rebuttal, as well as utter spinelessness among the leadership of the opposition party. That leaves most Americans in the position of a jury that has heard only one side of the case. ignorance In the latest New York Times/CBS News poll, 42 percent of those polled believed that Saddam Hussein was involved in the September 11 attacks. Not even the Administration has floated this allegation. This indicates the profound level of ignorance on which Bush's support is based. The headline for that story should have read: "Many Americans Misinformed About Iraq War -- The Rest Are Opposed." economy Yet even in the United States, 59 percent think the U.S. should "wait and give the U.N. and weapons inspectors more time." And 54 percent would oppose a war if "thousands of Iraqi civilians were killed," which is extremely likely. When the UN Security Council stood up to Secretary of State Colin Powell last week, the US stock market soared in response. Why? Because Wall Street knows that this war is very likely to hurt the economy. Unlike previous wars (World War II, Korea, Vietnam) that boosted economic growth, this one will almost certainly have the opposite effect. It will provide little stimulus to domestic production, while the uncertainty it brings will cause businesses to hold back on investment. And of course any further oil price increases will deliver another blow to the economy. on horizon But the war will provide a distraction, and Mr. Bush seems to have concluded that he needs this more than anything. We've had a jobless recovery from the last recession and the next one is already on the horizon. The federal budget -- with help from Bush's tax cuts for the rich -- is headed for a decade or more of growing deficits. What would these people have to show for themselves without a war? pre-emptive The White House claims it is defying the world on our behalf, to save Americans from the threat of another September 11 or worse. But nothing could be further from the truth. A "pre- emptive" war will drastically increase the chances of international terrorist actions directed at the attackers -- that is one of the reasons why Europe is so opposed. change Americans are increasingly coming to realize this too, and President Bush's approval ratings -- including those relating to his handling of foreign policy -- have been steadily dropping. As the saying goes, regime change begins at home.